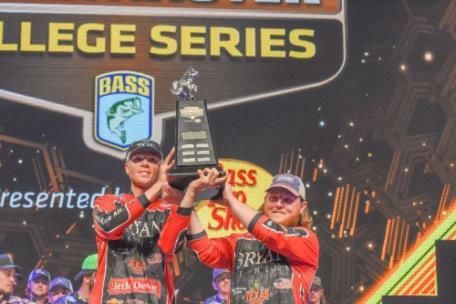 Cole Sands and Bailey Fain of Bryan College win the 2019 Carhartt Bassmaster College Classic presented by Bass Pro Shops out of Knoxville, Tn., with 13 pounds, 11 ounces on Watts Bar Lake. Cole Sands and Bailey Fain got ahead of today’s unfavorable weather conditions, sacked up a five-bass limit that weighed 13 pounds, 11 ounces and won the Carhartt Bassmaster College Classic presented by Bass Pro Shops on Watts Bar Lake. A passing cold front left the typical “bluebird” day — high, bright skies and light wind — in its wake, so the winners were happy to secure a limit by about 9:30 a.m.
After that, the day grew brighter and the bite became more difficult.